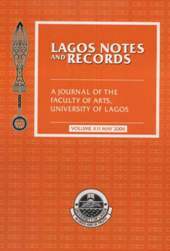 Lagos Notes and Records is an annual, interdisciplinary journal of the humanities. It is devoted to the publication of well-researched articles in all the subjects in the Arts, Social Sciences, and Law. In addition to original articles, the journal publishes review articles, brief accounts of work in progress, notes and comments on issues arising out of recent publications.